The land now known as Turkey has been a crossroads of travel for many centuries. 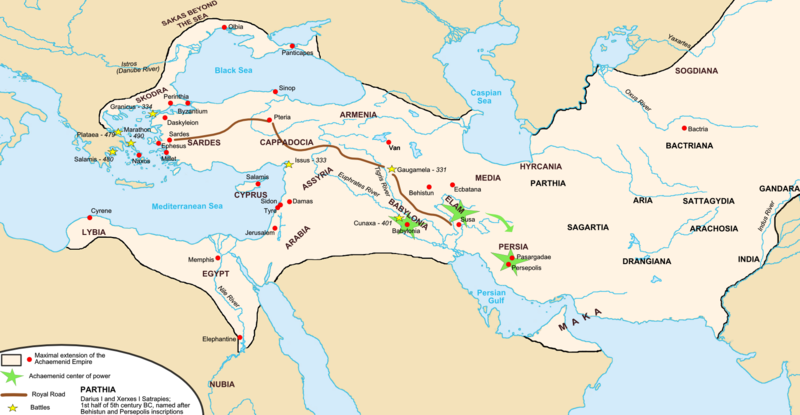 By the early 5th century BC, around 475 BC, the Persian Royal Road ran almost 2,900 kilometers from the Aegean Sea port of Smyrna (now İzmir), across Anatolia and through Cappadocia, and then roughly parallel down the Tigris River to the Persian city of Susa, on the lower Tigris and near the sea. The Achaemenid Empire, which was powerful about 500-330 BC, maintained and protected this critical trade route. There were Aechaeminid postal station and relay points at regular intervals, and with fresh horses and riders ready to leave each relay point, royal couriers could carry messages between Smyrna to Susa in just nine days. However, normal travellers took about three months to cover the entire route. The Achaemenid Royal Road connected into many other routes, such as those to Central Asia and India. Herodotus bragged about these routes in his writings around 475 BC, and the Biblical book of Esther mentions dispatches being sent from Susa to provinces as remote as India and Cush during the reign of Xerxes the Great in 485-465 BC. Map of the Silk Road routes under the Achaemenid Empire. Alexander the Great expanded his Empire into Central Asia in the 300s BC. He founded the city of Alexandria Eschate (or "Alexandria the Furthest") at the mouth of the Fergana Valley in today's Tajikistan in August 329 BC. Alexandria Eschate soon became a major staging point on one of the northern Silk Routes. The Greeks remained in Central Asia for the next three centuries, playing roles in establishing the Seleucid Empire and the Greco-Bactrian Kingdom in Bactria. They continued expanding eastward, especially in the late 200s BC, when Euthydemus extended his control as far as Sogdiana. Floor plan of a typical Safavid caravanserai. Euthydemus may have led expeditions as far as Kashgar in Chinese Turkestan, leading to the first known contacts between China and the West around 200 BC. The Silk Road carried more than just silks and spices. It also carried art, religion (Buddhism moving west, Greek dieties and Christianity moving east), technology (printing, gunpowder, and compass moving west, the astrolabe moving east), and transportation technology such as Chinese ship designs. 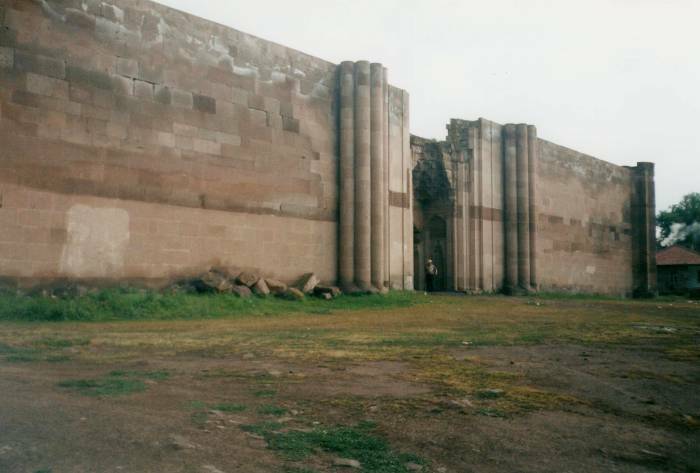 By about 1000-1500 AD, there were many rest stops along the trade routes through central and eastern Anatolia. 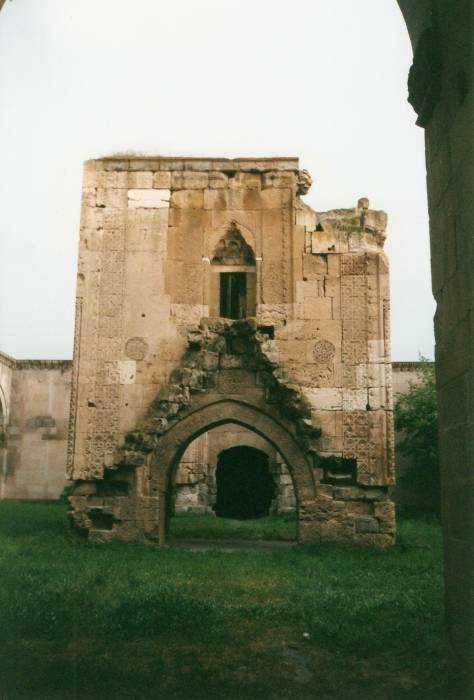 Known as Caravanserais (kervansaraylar in Turkish), or hans or khans, these were inns spaced along trade routes. Travelers could rest and replenish their supplies. Han is the Turkish word derived from the Persian khan. The Persian caravanserai means caravan-palace. In Persian, a caravanserai is usally a large station along a long-distance road while a han or khan is an inn within a town. Turkish uses han to refer to both. The tolls paid by caravans to use the road allowed them to stay for one or a few nights in each han along the way. They could rest, get food for the men and animals, repair or replace their gear, and trade with other travellers or the merchants operating within the caravanserai. 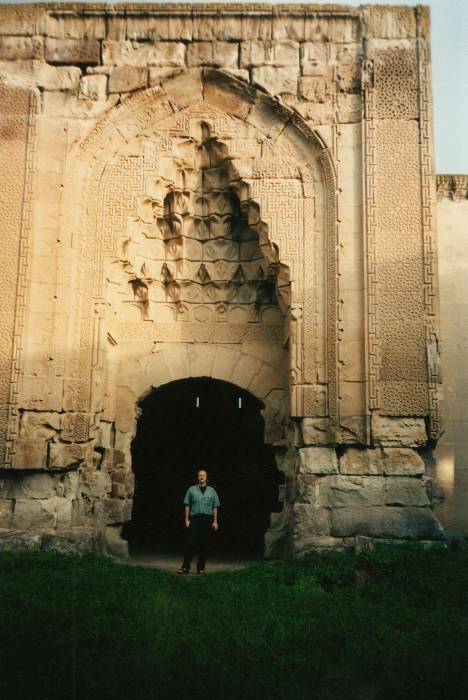 Typical caravanserai were square or rectangular fortified structures with one large portal permitting a heavily loaded caravan to enter or leave. There would be a large open courtyard open to the sky, surrounded by stalls housing merchants, sleeping chambers, and shelters for animals. 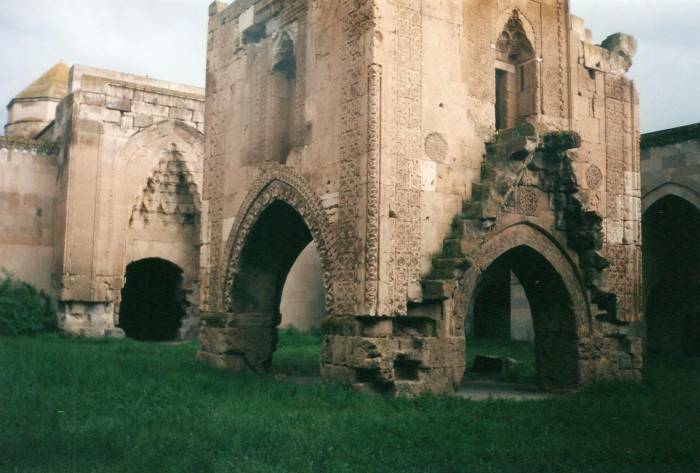 A caravanserai often had a bath, and after the spread of Islam, a small mosque. 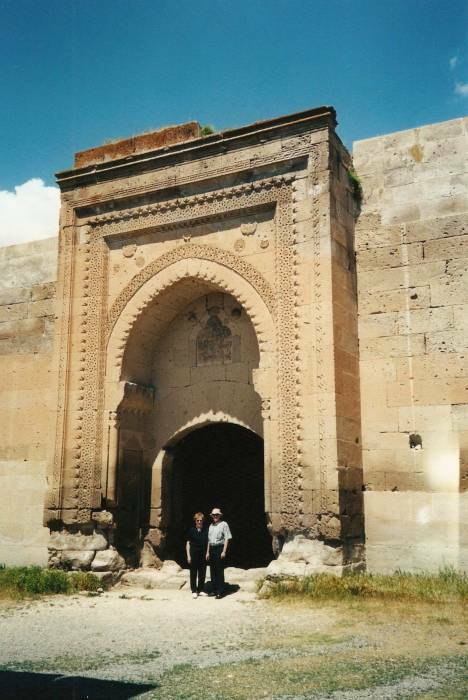 This is one of the gateways within the Ağzıkarahan Kervansarayları, one of those "truck stops" on the Silk Road from around 1000 to 1500 AD. Ağzıkarahan Kervansarayları is along the road from Konya to Göreme. 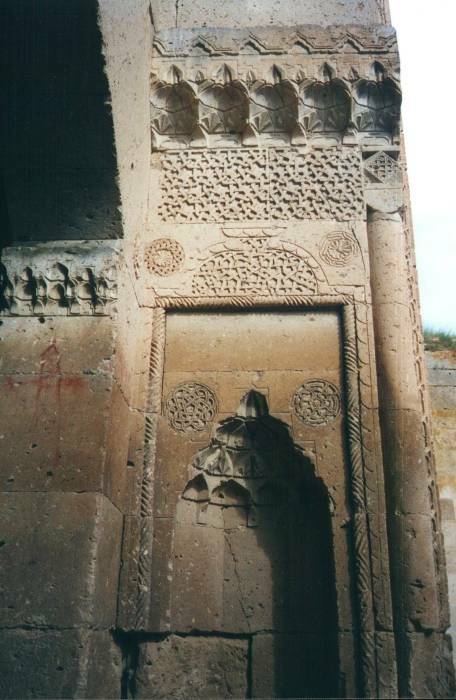 There are detailed carvings and a niche within the gateway at the Ağzıkarahan Kervansarayları. The carvings feature very detailed geometric patterns and knot-like designs. Some recent scientific papers have argued that Islamic civilization centuries ago was even more mathematically advanced than we usually think, and the proof of this is in the complexity of designs. The conventional view holds that girih (geometric star-and-polygon, or strapwork) patterns in medieval Islamic architecture were conceived by their designers as a network of zigzagging lines, where the lines were drafted directly with a straightedge and a compass. We show that by 1200 C.E. a conceptual breakthrough occurred in which girih patterns were reconceived as tessellations of a special set of equilateral polygons ("girih tiles") decorated with lines. These tiles enabled the creation of increasingly complex periodic girih patterns, and by the 15th century, the tessellation approach was combined with self-similar transformations to construct nearly perfect quasi-crystalline Penrose patterns, five centuries before their discovery in the West. 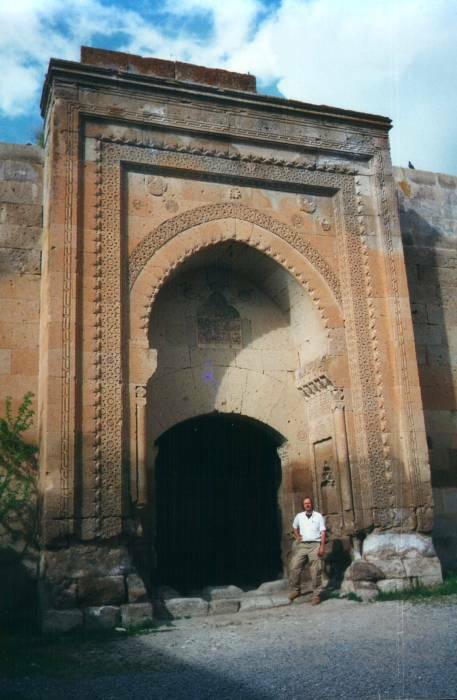 Karatay Han is at the village of Karatay, east of Kayseri. 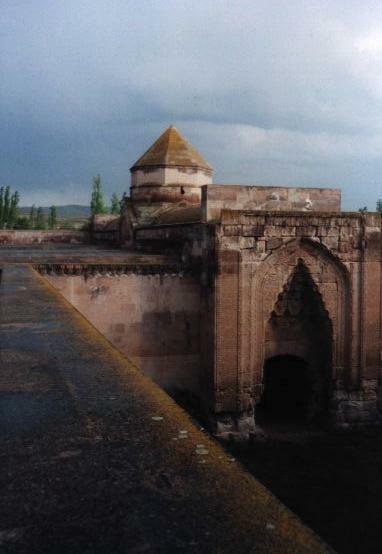 It was commissioned by Celalettin Karatay and built in 1240-1241 AD. 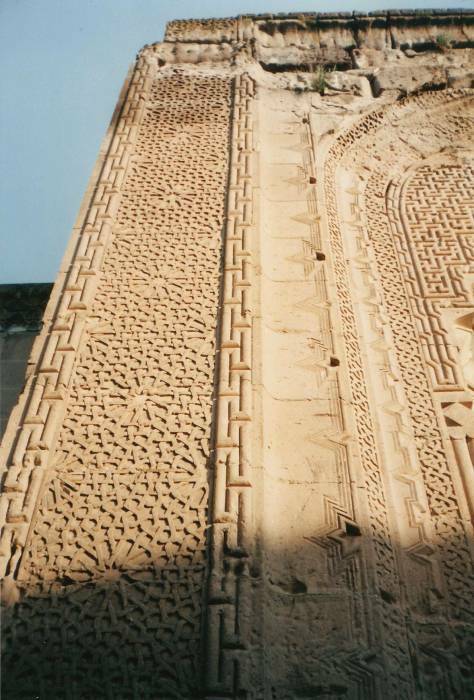 Intricate carvings cover the gateways off the courtyard of Karatay Han.